AbelCam allows for motion detection, ftp upload and e-mail notification, three of the key things I was looking for. depending on the Capture Interface used, there are various configuration options for the Windows Media Server. The Windows Media Server is configured per Capture Device. The video server has to run on a different port than the web server. Use http://localhost:8080/currentX.asx to load the video stream. This will redirect to mms://localhost:8090 where the video server is running. 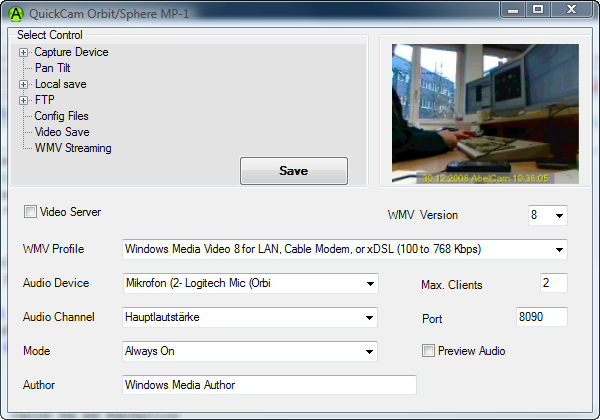 this server supports WMV on demand. 1) this means that you can provide your own offline.wmv and starting.wmv (for VideoCapX). Make sure those files are not too large.